By the end of the century, the Bay Area’s landscape could look more like Southern California’s, raising tough questions for land managers trying to preserve the region's protected lands. It may not be an official record, but by some accounts, more open space has been preserved in the San Francisco Bay Area than in any other major U.S. metropolitan area. More than a million acres are permanently protected from development – that’s almost one-third of the 4.5 million acres that make up the 10-county region. Now, with temperatures on the rise, land managers and scientists are beginning to ask how the Bay Area’s landscape will withstand climate change. As plants and animals are forced to shift, some of the Bay Area’s iconic parks and vistas could look dramatically different. Scientists say signs of those changes may already be appearing in places such as the hills east of downtown San Jose. “This is a blue oak,” says Nature Conservancy ecologist Sasha Gennet, examining the small, dark leaves of a towering tree on the Blue Oak Ranch Reserve, part of the University of California Natural Reserve System. “Here’s another dead one that’s also pretty young,” says field researcher Corinne Morozumi, pointing to the dried-out trunk of dead blue oak. She and UC Berkeley researcher Blair McLaughlin recently catalogued blue oaks across 20 square miles in the area, looking for dead trees. The results were surprising. 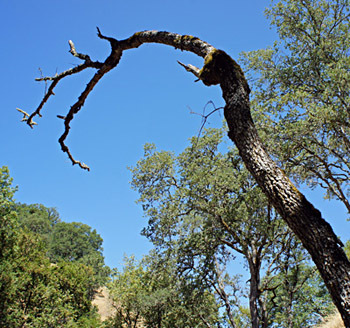 Across the study area, there were three times more dead oak trees in drier, climate-stressed areas than were found in cooler, higher elevations. “We are seeing what our models are predicting,” says Morozumi. About a hundred miles north, UC Berkeley ecologist David Ackerly walks across a wooded hillside, pulling small orange and yellow flags out of the ground. Each marks a young tree. Ackerly and his field team are counting trees and gathering data inside a 60-by-60 foot research plot, one of 50 on the 3,000-acre Pepperwood Preserve in Sonoma County. 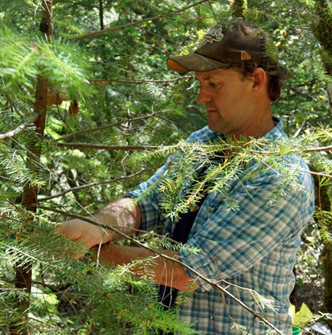 “If you want to see the forest of the future, you look at the small plants,” he says. The plots will become a baseline for studying climate change, as the study team returns in five and ten years to document changes in the plant community and water availability. Change is what Ackerly expects to see, in the form of warmer temperatures, heat waves and more intense drought. That could lead to an expansion of plants more commonly found in Southern California, like chaparral, the dense shrubs and bushes that thrive in drier conditions. Ackerly says under some climate scenarios in the Bay Area, there could be twice as much land with conditions that favor chaparral. Oak trees and other plants may need to move, either to higher elevations or closer to the coast where it’s cooler. “But oaks don’t pick up and move to the coast,” Ackerly says. “These oaks are never going to move that we’re looking at today. Their seeds will be picked up by a jay or a squirrel and moved half a kilometer or maybe some jay flies over to the next hillside, occasionally." For some oak trees, it could become an “acorn-by-acorn” race with climate change. Human management and fire also play a major role in how fast plants can move. For land agencies, applying global climate change projections on a local level is no simple task. Parks and open spaces are often managed to maintain the historical landscape. “Until now, our management objectives have been to keep the preserve essentially the same: have the same amount of grassland, the same amount of woodland,” says Lisa Micheli, executive director of the Pepperwood Preserve. Planning for climate change may also require taking a longer view. “When do land managers start that process?” says Ryan Branciforte of the Bay Area Open Space Council. “Their horizon for planning for land management may be days, weeks, months, maybe years, but it’s surely not 50 and 100 years." The Bay Area Open Space Council is working with the scientific community to develop localized climate change planning information for Bay Area land agencies, something many are eager to use. Anderson says the park district is planning for sea level rise at their shoreline parks with wetland restoration, currently underway at Breuner Marsh in Richmond, part of the Point Pinole Regional Shoreline. Wetlands act as natural buffers against rising seas. With dynamic changes on the horizon, the Bay Area’s conservation community is grappling with a tough question: are today’s open spaces the places that should be protected tomorrow? The Nature Conservancy recently purchased a 100-acre property in Santa Clara County with climate change in mind. They plan to restore habitat on the Upper Pajaro River, potentially improving the corridor between the Santa Cruz Mountains and open spaces near San Jose.